Kent's "Hooligan Libertarian" Blog: In "Alignment"? As an educator, long before I would have admitted anarchy, I was wary of multiple-choice exams and/or "assessments". Sure, they make for easy grading (and easy categorization as well -- which I also eschewed as a snot-nosed kid). The author will always inject his or her prejudice into multiple choice forums -- s/he can't avoid it. You can't possibly offer enough choices to cover all human action when you set out to compose a "multiple choice" exam or assessment. For that reason, even though I admire our friend, Jim, I abstain from participation or recommending TOLFA. I don't have all the answers to what makes for "proper" freedom and liberty. Neither do you -- nor does Jim. We all pretty much agree that nobody has a "right" (whatever that's supposed to mean) to commit aggression. You (and I) include trespass, theft and fraud under "aggression" -- and well they should be included. I even go so far as to include intellectual blackmail ("...all thinking people understand [thus-and-such]..."), which puts me on more shaky ground. I went ahead and completed the "test" since you had posted it; but admit that, since none of the choices fit me, toward the end I ended up "x"ing stupid stuff that had no relation to my personality just to get the thing finished off. My category came up "chaotic good"; which, I suppose, is appropriate to me (at least the chaotic part). I would think "chaotic good" is a pretty accurate assessment for you. From what I've seen. "Most" of the questions (in that first test linked) had an easy answer for me- but there were those which didn't. And that is why I suspect I might be a little off on the results, but not too much. 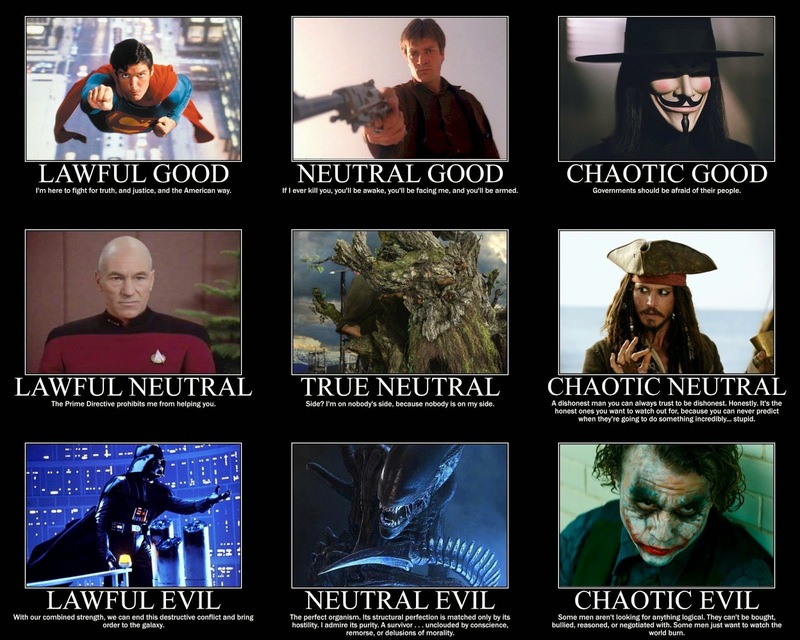 I've been chaotic good since I first picked up D&D back in 1980. I never got into D&D. It first gained popularity back in my church-going Christian days- and D&D was the subject of many a sermon and warning. Pure "evil" and "Satanic". So I had never heard of the "alignment" thing. I still don't "get" the role-playing game thing. But just because life keeps me busy enough as it is, without trying to live another life (or two) simultaneously. My son plays online games which I suppose are "role-playing" games, but I don't get the appeal. Not that it bothers me in any way- it just doesn't interest me enough to get into it. Around 1975 I teamed up with the inheritor of Dr William Marston's DISC personality profiling system -- just at the outset of personal computers. We had 5 1/2 floppys that went with our profiling (use of the word "test" was verboten), and I'd go into firms and sell personnel managers (later called by the collectivist "human resources") on having us do assessments in all their departments. There were around 12 "readouts" on each floppy -- that presented a format of about what the assessment you posted read. After all, they felt like they were getting their money's worth if each of the readouts was verbose (if not redundant as well), so each "style" had a readout that went on, and on -- presenting point-after-point of character examples. I didn't last long in that one. It was one of my attempts at "managing and controlling" -- I would insist the assessments not be used for hiring or firing or promoting or demoting. Supposedly, the knowledge was to help department managers in assigning tasks, interrelationships, etc etc. But, once sold, the assessments belonged to the firm, not me. They had the "right" to use them as they saw fit and wanted. Got a lot of bad vibes from people to whom I administered the assessments. How would you feel if the bosses called you in for a personality profile assessment? Threatened is how many felt, and who could blame them? Each felt the "test" might be used to put them on the "ease out" list.